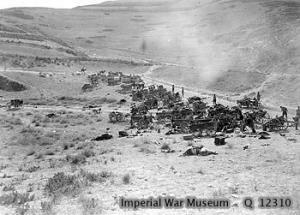 The Battle of Megiddo (Turkish: Megiddo Muharebesi, less commonly known as the Battle of Armageddon and sometimes called the Rout of Nablus (Nablus Hezi) or the Battle of the Nablus Plain by the Turks), from 19 September to 1 October, 1918, and its subsequent exploitation, was the culminating victory in British General Edmund Allenby's conquest of Palestine during World War I. British Empire forces made a massive push into the Jezreel Valley from the west, through the Carmel Ridge, then engulfed the Ottoman forces in the valley and on the River Jordan. When he was made a viscount, Allenby took the name of this battle as his title, becoming the First Viscount Allenby of Megiddo. Allenby, nicknamed the "Bloody Bull", is generally considered to have been a martinet who tyrannically ruled over the men serving under him. However, Archibald Wavell, a British field marshal during World War II who had served under Allenby, defends him as being an intelligent and caring man, if a professional consummate soldier. T. E. Lawrence ("Lawrence of Arabia"), whose efforts with the Arab Revolt were greatly aided by Allenby, thought similarly of him: "(He was) physically large and confident, and morally so great that the comprehension of our littleness came slow to him". Allenby was arguably one of the most successful British commanders of the war, utilising strategies he developed from his experiences in the Boer War and on the Western Front towards his Palestinian Campaigns of 1917–18. 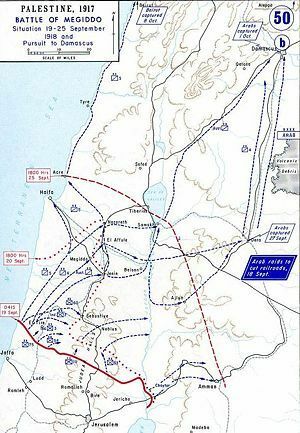 His management of the Battle of Megiddo in particular, with its brilliant use of infantry and mobile cavalry, is considered by many to be a precursor to the Blitzkrieg tactics so widely employed by Germany during World War II.